The origins of Valentine’s Day are murky. February, however, has long been associated with romance, a month thought to mark the beginning of the mating season for birds. One legend involves Valentinus, a theologian and teacher. During the third century, Valentinus was imprisoned for his Christian beliefs and sentenced to death. While jailed, according to Roman legend, Valentinus restored the sight of his jailer’s blind daughter. The night before he died, Valentinus wrote a farewell note to the girl, which he signed, “From Your Valentine.” His sentence was carried out the next day, Feb. 14, 269 A.D.
Valentine’s Day is always observed on February 14. Esther Howland of Worcester, Mass., published the first American valentine in 1849. In addition to the United States, Valentine’s Day is celebrated in Canada, Mexico, United Kingdom, France, Australia, Denmark and Italy. Valentines pre-date Hallmark and were among the first types of cards the company offered. 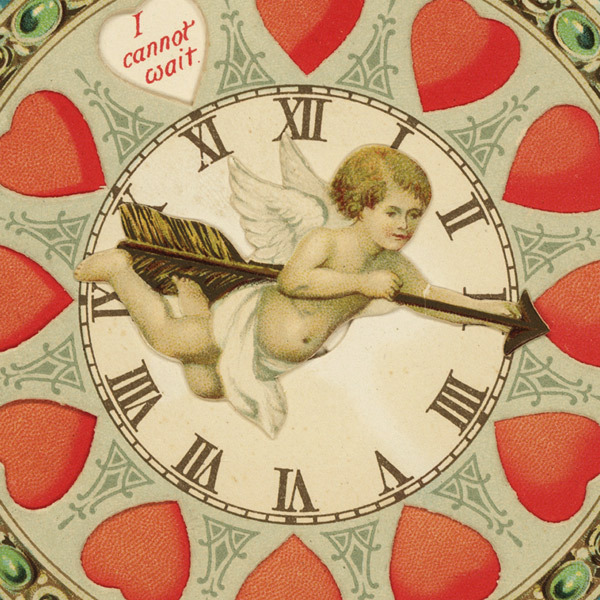 A fire in 1915 that destroyed the company’s inventory of Valentine postcards led to the purchase of printing equipment so Hall Bros. (which would become Hallmark) could begin creating its own Valentines and other cards. The decade may have roared, but the invitation to join this lass on the loveseat was shy and sweetly coy. The color on this and other Hallmark cards through the 1920s and 1930s was applied by hand, until lithography made color printing feasible. Rub-a-dub-dub, what’s that in the tub? It’s a washboard, common in households before washing machines were widely available. Even with patched pants, love prevailed in this Depression-days Valentine. “From me, your little sweetie pie, who really, truly loves her guy,” is the message inside this Valentine from a wife to her husband. “Don’t be silly,” reads the rest of this Hallmark card intended for a loved one serving in the Korean war. “And ZOWIE, they still do!” reads the message inside of this swell Hallmark Valentine. Smoking was cool until the Surgeon General’s office issued its warning in the mid-1960s. No cautionary message about hairstyles of the day, however. “…is more nice people like you!” reads the inside of this happy hippie Hallmark Valentine card. …but it was the frog who came bearing gifts! Inside, this card from Hallmark’s Mahogany line continues: “You move through me like a summer breeze, awakening my senses, stirring my emotions, making me feel alive… Your love is like air, and in you, I breathe.” Steamy! Whether it was “like” or “love”… a new romance or a long-term relationship, “Look, it’s Cupig!” could work its whimsy on a range of 1990s relationships and situations. It’s a fairy-tale image in this Hallmark card, with words grounded in the reality of new millennium relationships. He… she… a parked car… it’s the 21st century version of an age-old theme, set to a popular country tune courtesy of this Valentine Card With Sound. “I’m nuts about you!” reads the inside of this consumer-created Valentine, a finalist in a Hallmark Card Contest, one of many fun options for our greeting card future.